Small amount of local anesthetic is sufficient for the simple surgical procedure to insert the AbsoAnchor® microimplant. It is not necessary for the clinician to achieve profound anesthesia of the teeth; rather only the soft tissue need be anesthetized. Only one-fourth of a local anesthetic carpule is needed for this type of anesthesia. Sometimes, only topical anesthetic agent (Dentipatch , Mucopain, Painless patch, Lidocaine spray etc) is enough for microimplant placement. If the patient feels some sensitivity during drilling or microimplant driving, that sensation is a sign of the microimplant touching the roots - the drill or microimplant should be redirected away from them. When anesthetizing the palatal mucosa, the needle also can be used to probe and measure the mucosal thickness, which helps to determine the screw length necessary for anchorage (Fig. 1). When the palate is anesthetized, the position of the greater palatine artery and nerve should be reviewed so as to avoid injuring them (Fig. 1). When planning the use of one or more microimplants in extraction patients, the microimplants can be placed just before the teeth are removed. Combining microimplant placement and tooth extraction at the same appointment eliminates additional surgical procedure. Fig. 1 Sometimes, only topical anesthesic agent is enough for microimplant placement. Palatal mucosa varies greatly in thickness, which requires measurement during or after local anesthesia in order to select the proper length microimplant. Review the positions of the greater palatine artery and nerve so as to avoid them. Zepherin (benjalkorium chloride) sponge or other common disinfecting agent can be used to prepare an intraoral & extraoral scrub for keeping the surgical area aseptic (Fig. 2). Fig. 2 Aseptic intraoral and extraoral preparation with disinfecting agent. Mark the implant sites by using brass wires as shown in Figs. 7, 8 & 9. Clinicians should use a speed-reduction contra angle hand piece (64:1 or 20:1 etc.) to make the original entry into the bone (Fig. 3). Fig. 3 Various types of drill bits (left) and speed-reduction contra angle : 64:1 (Right). Before using the pilot drill, use a #2 round bur (Ø 0.9mm) first to make a small indentation on the bony surface. Round bur also can penetrate attached gingiva directly to the bone. Small indentation on the bone surface can prevent slippage of pilot drill especially when drilling diagonally. The indentation can be very useful especially when encountering extremely dense cortical bone (Fig. 7 & 8). Using round bur can also help to reduce the blunting of pilot drill since the pilot drill is much more expensive than the bur. Drill-free method can be used when a larger diameter pure titanium microimplants or microimplants that are made of titanium alloy. It is recommended to extend the drill to the full length of the screws if using a smaller diameter of pure titanium microimplants. The diameter of the drill end should be at least 0.2/0.3mm smaller than that of the selected microimplant. Before beginning the surgical penetration, the clinician should check the drill for any unwanted bends in the shaft that might cause it to wobble while drilling, resulting in unduly large opening. The microimplant depends almost entirely upon mechanical retention within the bone and must have a slightly tight fit to ensure its retention. The drill can penetrate the mucosa, attached gingiva and underlying bone without a surgical flap (Fig. 4). However, when making an entrance around movable soft tissue, a small vertical incision (less than 4mm) will prevent a soft tissue roll-up around the drill (Fig. 5). If you do not want to make an incision, you can use drill guide to prevent rolling of soft tissue (Fig. 6). Fig. 4 Maxillary and mandibular micro-implants applied to attached gingiva (pre-drilling method). Fig. 5 Vertical incision is needed when microimplant applied to maxillary and mandibular movable soft tissue (pre-drilling method). Fig. 6 Construction of a indirect drill guide. Using of indirect drill guide can reduce root touch. To reduce heat production, drilling speed should be around 500-1000rpm. When drilling into dense cortical bone, move the drill carefully up and down as well as stop and go strokes with normal saline irrigation to compensate for the heat generated during drilling. To increase torque with reduced rpm, prosthetic implant engine is a good but expensive choice, so speed reduction contra angle (64:1 or 20:1, Fig. 3) would be a reasonable alternative. Non-speed reduced low speed (1:1) contraangle gives high rotation speed (maximum 30,000rpm) which leads to excessive heat production. On the other hand, lowering the rotation speed of 1:1 contraangle to reduce heat leads to weaker torque, so that it may not penetrate dense bone. The microimplant sites in the maxilla require 30-60 degrees of angulation to the long axes of the teeth, both buccally and lingually (Fig. 4). Such angulation augments the surface area contact between the microimplant and the cortical bone and also increases retention while lowering the risk of making contact with a root. In the mandible, the bone has a thicker cortex and a higher density than the maxilla. However, the volume & thickness of buccal bone is less available from the lower anteriors to the distal of the 1st molar (Fig. 10). Thus in these areas, the microimplant is usually inserted more perpendicular to the long axis of the teeth. In the 2nd molar area, more volume and thickness of buccal bone is available and the microimplant can be placed in a more oblique or vertical direction (Fig. 4). Nevertheless, doctors should remember that cortical bone density and volume will vary from patient to patient and from side to side, even in the same patient. A final surgical caveat-do not use excessive force with the drill. Any great resistance after passing through the cortical plate is probably due to root contact. The drill angulation needs to be changed. Fig. 7 Maxillary microimplant applied to attached gingiva (pre-drilling method). Fig. 8 Maxillary microimplant applied to movable soft tissue with a surgical incision and pre-drilling method. Fig. 9 Maxillary microimplant applied to palatal mucosa with a pre-drilling method. Note that more space exists between palatal roots than buccal ones. Fig. 10 Mandibular microimplant applied to attached gingiva (pre-drilling method). Note the thickness of the cortical bone in the mandibular labial and buccal area. Fig. 11 Mandibular microimplant applied to movable soft tissue with a surgical incision and a pre-drilling technique. Fig. 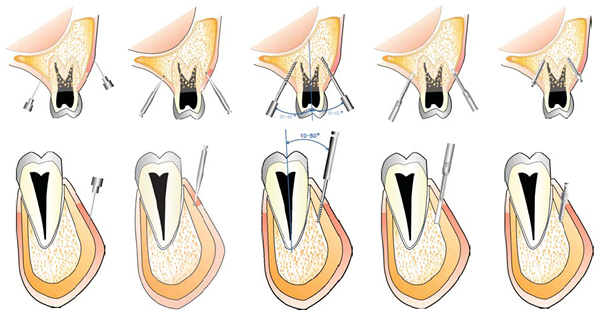 12 Two types of drill-free procedures. One-step (above) & two-step drill-free procedures after round bur indentation (below).